I followed a Matt Moran's recipe for a raspberry ripple ice cream. You would think as a froyo fan I would of made froyo but hey, they call it a challenge so might as well choose the harder recipe, what the hell was I thinking.. 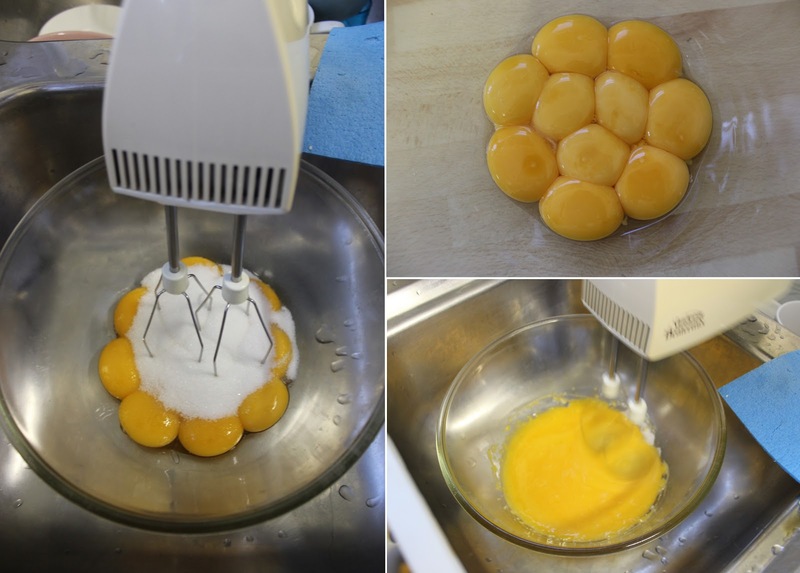 I was shocked when I realised how many eggs you need to make ice cream and it was also the egg yolk as well. O well but YOLO I guess right? Before you prepare anything, you need to place the ice cream bowl in the freezer (below minus 18 degrees) for at least 12 hours. I left mine overnight, the colder the better. To prepare the milk for the custard, you need to split the vanilla bean in half and scape out the seeds. Place the seeds and scraped pods into a saucepan, add the milk and bring to simmer. Remove from the heat and leave the milk to infuse for 10 minutes. Top right: the egg yolks, how pwetty do they look? Whisk the egg yolks and the sugar together for approximately 2 minutes until pale and fluffy. Next, mix this mixture with the milk stirring as if your life depended on it. Now here is the tricky and probably the hardest bit. When you pour milk into the mixture, I recommend doing it a third of it at a time so you can temper the eggs. I actually had to do this process twice because I had my heat on way too high and my whisked sugary egg yolks became scrambled eggs LOL! Being a kitchen nob, I completely freaked out.. but thankfully my friends on twitter came to my savior. In the second attempt to make this custard, I placed the milk (pouring in one third of it at a time) as well as the whisked sugary eggs in a water bath and stirred like crazy. Thank you GraysOutlet for the additional amounts ingredients, the back up stash was my second savior and for those that are wondering, yes my fridge now has a huge bowl of 20 egg whites. Once the custard developed into a thick liquid, the recipe tells you to chill it in the refrigerator for an hour. Since I didn't prepare this custard yesterday I placed mine in the freezer to save some time. Once the custard was chilled, you pour it into the ice cream machine and start churning that baby, churn baby churn, churnnnnnnnnnnnnnnnnnnnnnnnn! Give it about 10 minutes and you will start to see your ice cream developing. After 20 minutes, your ice cream should look like mine. I found that since I had put my custard in the freezer, it made it more chilled which probably helped the churning of my ice cream. To prepare the raspberry sauce, place the raspberries into a blender and blend until smooth. The recipe mentioned to pass the seeds through a sieve, I don't mind the seeds so I skipped this step plus it is one less item to wash up. Cook for 2 to 3 minutes until the raspberry juice reduces to a thick consistency. Once the ice cream turned thick and creamy, you can fold the raspberry syrup until a ripple effect has been formed. I was too excited so I poured some of the syrup into the machine for more churning, it was harmless anyways. Once its done, take the ice cream out and fold the raspberry syrup through the ice cream till you see a ripple effect. I didn't end up using all the raspberry syrup as I found it was more than enough. Finally, if your ice cream to be extra firm, place it back in the freezer. I will not deny that it takes a humongous amount of effort to make home made ice cream if you were to compare it to buying it out right. After going through all that and seeing the final result, I was surprised at how satisfied I felt. I can't wait to explore new flavours with my new baby. So tell me peeps, what are some of your favourite home made ice cream flavours? Food is our religion participated in the Go Cooking Challenge as a guest of GraysOutlet and Polka Dot PR. Hi Simon - Thanks! but my first batch of custard was so fail! Great final result for your first go (ignoring the scrambled eggs ;p) I love making homemade ice cream, not that hard, it is basically frozen custard. Hi Sara - Thank you! After the second batch being successful, I can't wait to check out more flavours! Hi Christine - me too now! I've made accidental scrambled eggs before too and it's so frustrating so I can totally relate! But good on you for persevering and your final product looks fantastic! Hi Jacq - omg thank you for sharing the pain!! Hi Missklicious - The process was quite fun!